Forget the headphones you saw in the Warner Brothers thriller Contact, as well as the guttural throbs emanating from loudspeakers at the Very Large Array in that 1997 movie. In real life, radio telescopes aren't used for "listening" to anything -- just like visible-light telescopes, they are used primarily to make images of astronomical objects. Now, the National Radio Astronomy Observatory (NRAO) wants to encourage astronomers to use radio-telescope data to make truly compelling images, and is offering cash prizes to winners of a new image contest. "Astronomy is a very visual science, and our radio telescopes are capable of producing excellent images. We're sponsoring this contest to encourage astronomers to make the extra effort to turn good images into truly spectacular ones," said NRAO Director Fred K.Y. Lo. The contest, offering a grand prize of $1,000, was announced at the American Astronomical Society's meeting in Minneapolis, Minnesota. The image contest is part of a broader NRAO effort to make radio astronomical data and images easily accessible and widely available to scientists, students, teachers, the general public, news media and science-education professionals. That effort includes an expanded image gallery on the observatory's Web site. "We're not only adding new radio-astronomy images to our online gallery, but we're also improving the organization and accessibility of the images," said Mark Adams, head of education and public outreach (EPO) at NRAO. "Our long-term goal is to make the NRAO Image Gallery an international resource for radio astronomy imagery and to provide a showcase for a broad range of astronomical research and celestial objects," Adams added. 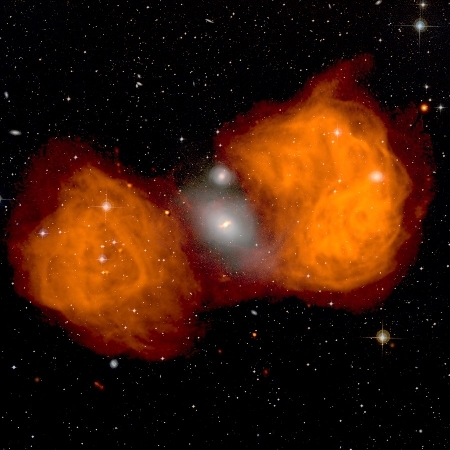 In addition, NRAO is developing enhanced data visualization techniques and data-processing recipes to assist radio astronomers in making quality images and in combining radio data with data collected at other wavelengths, such as visible-light or infrared, to make composite images. "We encourage all our telescope users to take advantage of these techniques to showcase their research," said Juan Uson, a member of the NRAO scientific staff and the observatory's EPO scientist. "All these efforts should demonstrate the vital and exciting roles that radio telescopes, radio observers, and the NRAO play in modern astronomy," Lo said. "While we want to encourage images that capture the imagination, we also want to emphasize that extra effort invested in enhanced imagery also will certainly pay off scientifically, by revealing subtleties and details that may have great significance for our understanding of astronomical objects," he added. Details of the NRAO Image Contest, which will become an annual event, are on the observatory's Web site. The observatory will announce winners on October 15.